So what is new this time. It has to be alot because i have not written anything interresting for a while. Heidi and Sebastian went to Denmark some months ago and i was all alone. It gave me the opportuity to work alot. I got alot done but i surely didnt like beeing alone. Since they came home we've bought plenty of stuff for the house. We finally found the chairs to go with the table already displayed earlier. We wanted 6 so we could invite more guests than earlier. Heidi has been wondering why i never asked for a new phone.. we had nokie 33... something.. the ooooold phones. But hey they work and its just a phone. 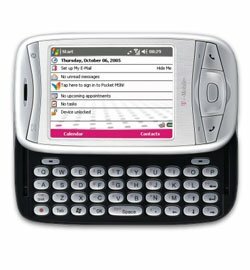 So i never really needed a new fancy phone with color etc. As you can see on the picture above its a pocket PC with slide out keyboard... and what can i say, i like it :) Now i can check email, surf the internet and send pictures from my pocketpc everywhere. 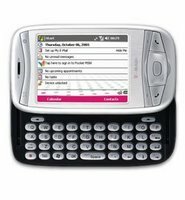 I will most prob (once i found out how) start blogging from my pocketpc when i get a spare minute. I love the new phone. They do not offer that in Chattanooga T Mobile locations. I am fed up with Verizon myself but I have another year before being released from my contract. Like the table and chairs looks nice and with six you can have a lot of good company over at once.